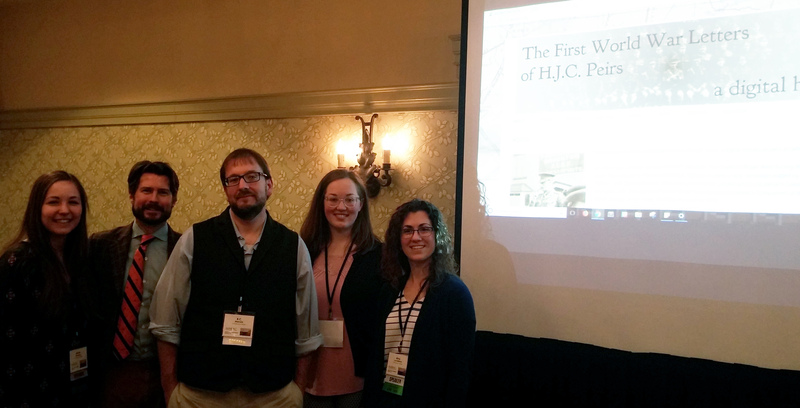 On April 14, #TeamPeirs presented a session about the First World War Letters of H.J.C. Peirs at the spring meeting of the Mid Atlantic Regional Archives Conference (MARAC). It was a chance to show off the project to my archives colleagues. In my opinion, our project, one that weaves a brilliant archival collection into a digital humanities project and creative pedagogy, has found “the Sweet Spot” of “communication, collaboration and archives” referred to in the conference literature. I have attended and presented at MARAC before, and in some ways our panel was similar to those I have seen in the past: we described the collection and the development of our project. We included challenges we have faced and solutions we have found (or hope to find). In other ways our panel was unique: I was the only archivist on the panel and I did not talk about archival theory or practice at all. We highlighted our collaboration with students in the best way we know how, by letting them speak for themselves. It is relatively uncommon to see an undergraduate on a MARAC panel. We emphasized the high quality of work that we expect from our students and that we make sure they are paid, but just as importantly their opinions are respected and their voices are heard. Needless to say I was proud of my fellow panelists and happy with the reception they received from my professional colleagues. I have joked in the past that we stubbornly call our project a “digital history,” but our commitment to doing history was another point of emphasis. As an archivist, I see it as a victory for the field when a collection gets the attention it deserves and this was a room sympathetic to that notion. 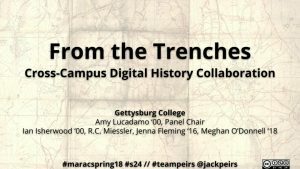 This entry was posted in Commentary and tagged #teampeirs, archives, presentations on April 19, 2018 by Amy Lucadamo.